This post originally appeared at Edutopia. What It Is: According to the Young Writers Program, NaNoWriMo is “a fun, seat-of-your-pants writing event where the challenge is to complete an entire novel in just 30 days. For one month, you get to lock away your inner editor, let your imagination take over, and just create!” According to me, 8th grade English teacher, NaNoWriMo is the best writing project I have ever seen my students tackle, and it includes writing process, community, strategies, revision, and publishing. 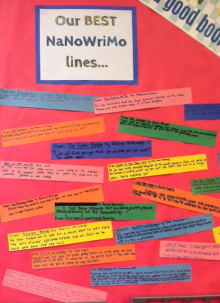 So how does NaNoWriMo turn students into enthusiastic writers? The actual writing of the novels starts on November 1, but free curriculum provided by the Young Writers Program of NaNoWriMo makes it easy for teachers to devote weeks (even a couple months) of valuable class time to the project. Visit the Young Writers Program to get started, and check out my own NaNoTeacher site for help bringing this awesome writing experience to your students. Stay tuned over the next couple months for a few more posts on the NaNoWriMo project: getting your classroom ready, getting your students ready, assessing their work, and publishing.